What does your smile say about you? Is it an easy grin, showing that you have a warm and friendly personality with a great sense of humor? Alternatively, is it a more shy and reserved smile, hiding your teeth instead of revealing them? Having unsightly stains and chips on your teeth can make you feel like keeping your smile to yourself, leading to problems with not only your self-esteem but also with forming lasting relationships. Nobody should have to feel bad about their smile, which is why we here at Frank Hsu, D.D.S. take great pleasure in fitting our patients with porcelain veneers and Lumineers to help them restore both their confidence and their smile. Porcelain veneers can greatly improve the appearance of your teeth. Comprised of thin sheets of strong and durable porcelain, they are custom fit to the shape of your teeth. Unlike bonding or other materials that are “painted” onto your teeth, these are sheaths that are made from a cast of your teeth. They can conceal chips, stains, and uneven gaps and spaces between your teeth. They can help your teeth look more even and uniform and can conceal any cosmetic blemishes or flaws. We start the procedure by carefully and gently abrading your teeth. This helps to allow the porcelain veneers to fit securely to them. We will also shape them down to ensure the veneer fits well over them. Next, we will take impressions of your teeth to cast a mold of them. This impression will be sent to our laboratory, which will start working on making your veneers. You can expect this entire procedure to span two appointments, with a wait of two to three weeks between the first and second appointment. During your first appointment, we will also choose a color for your veneer to help it look attractive and natural. When your veneers return to us from the lab, we will have you come in for your second appointment. During this appointment, we will clean your teeth with a specific type of solution that will help allow the veneer to adhere to your teeth better. We will check the fit of the veneer, and once we are satisfied, we will add bonding cement to affix the veneer to the surface of your tooth. We will then cure it with a special ultraviolet light to help it become sturdy and strong. For our patients who are looking for a thinner veneer, you may want to know more about Lumineers. 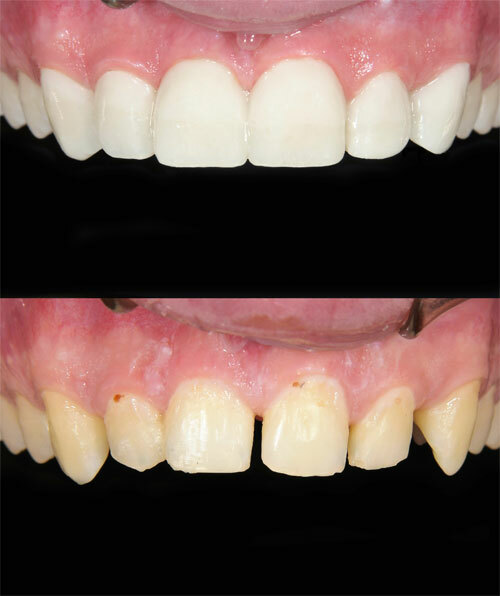 Lumineers are similar to traditional porcelain veneers in many ways but require less invasive measures to place them. Traditional porcelain veneers do occasionally require anesthetic to help prevent discomfort, but because Lumineers are thinner, they require less surface enamel to be removed from your teeth. We do not need to place temporary acrylic veneers either, meaning that Lumineers can often be completed in just one appointment. If you are interested in learning more about porcelain veneers or Lumineers, we are more than happy to answer any questions that you may have. To learn more, or to schedule an appointment with us here at Frank Hsu, D.D.S., please give our office a call at today 650.262.1940.